Originally from East Asia, Shepherd’s Purse is now widespread and can be found growing across the globe. It is an annual, belonging to the Mustard family (Brassicaceae). The flowers are particularly small, with four white petals, clustered at the terminal part of the stem. 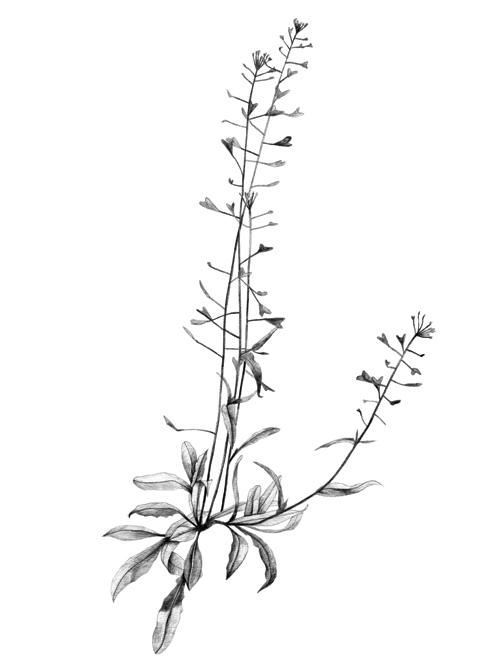 The leaves and stem grow out from the base of the plant, reaching up to 50 cm in height. Shepherd’s Purse is characterised by the presence of a heart-shaped pods that grow around the length of a protruding stem. Shepherd’s Purse is a common plant that is often seen growing along footpaths, within urban lawns and disturbed soil and waste-ground throughout the city. It grows particularly fast and produces a very high number of seeds. This plant has been used since historical times for its therapeutic effects mostly in the application of wound-healing. The authors are not responsible for any adverse effect or consequences resulting from the use of the information published in this website. Fuchs, L. New Kreuterbuch (Basel 1543). Neuausg Leipz. KF Köhler (1938). El-Abyad, M. S., Morsi, N. M., Zaki, D. A. & Shaaban, M. T. Preliminary screening of some Egyptian weeds for antimicrobial activity. Microbios 62, 47–57 (1990). Kuroda, K. & Akao, M. Antitumor and anti-intoxication activities of fumaric acid in cultured cells. Gann Gan 72, 777–782 (1981).